From 2 September 2018, there will be minor changes to some services. The weekday journey at 7.55am from Gateshead will now commence from Byker Morrisons at 8.13am. The weekday journey at 9.00am from Tynemouth will now commence from Marden Estate at 8.52am. There are no other timetable changes. The weekday journey at 7.35am from Eldon Square will now run five minutes earlier throughout. The weekday journey which arrives into Consett at 8.21am will be replaced by a revised service V3. Following passenger requests, the Sunday morning journey from Gateshead to Metrocentre at 7.40am will be replaced by a journey on service X66 at 7.40am, improving access to Metrocentre for workers starting at 8.00am. Some evening journeys are retimed by one minute. Towards Newcastle, evening journeys will run via Sage Gateshead to maintain access to Newcastle from this location. These journeys will run as service 58A. Therefore, evening journeys will be retimed by a few minutes. The timetable for this service is revised, with most journeys running 10 minutes earlier. More evening journeys will serve Sage Gateshead to maintain access to Gateshead from this location. The weekday journey on service 97A at 2.31pm from Fellside Park to Newcastle and at 3.14pm from Newcastle to Whickham will run during school holidays only. The weekday journey at 8.39am from Metrocentre now commences from Crookgate Pack Horse at 8.55am. The weekday journey on service V3 which departs Consett at 7.58am will now depart at 7.55am and will be revised to run as service V3A, running via Blackhill and Benfieldside Road instead of Shotley Bridge Hospital, serving Number One Roundabout instead of Genesis Way. The weekday journey on service V4 at 7.30am is retimed two minutes earlier. On weekdays journeys before 9.30am will be retimed. An additional journey will run on Sunday mornings at 7.40am from Gateshead to Metrocentre following passenger requests. 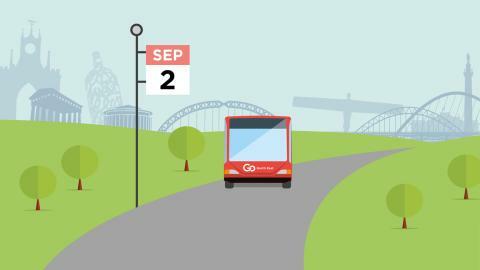 Some evening journeys will be withdrawn following the end of the Great Exhibition of the North, though Sage Gateshead will be served by some revised Loop 93/94 journeys, and CityLink 58 journeys towards Newcastle.